Working a 9 to 5 is no joke, but you do what you gotta do to get the food on the table, or to get the table at Drais. Either or. 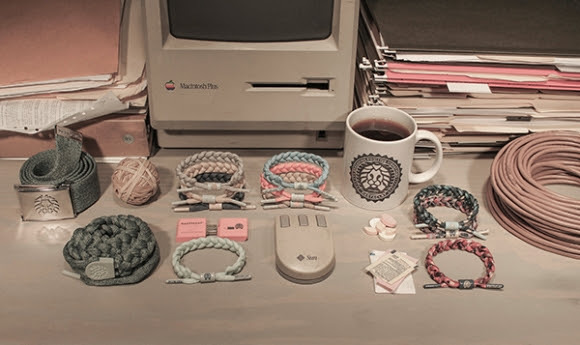 Inspired by the work-a-day life style that has chained us to corporate America, Rastaclat introduces the Daily Routine Capsule with four new roguish silhouettes in addition to the classic bracelets and original patterns in an assortment of colors. Click through for more details along with a dope behind the scenes video. The newest bracelet silhouette features a sleek, branded buckle that fashions the bracelet to your wrist. The Daily Routine Capsule also has a bracelet for each day of the week, with the 7 Classic Bracelets named after the days of the week to give you a new Daily Routine to put some color in your life or on your wrist. There are also three variations on their “pill print” named Ctrl, Alt, Delete – the variations helping you shut down the limits to your life in the cubicle. Rastaclat has also explored new additions to their accessories, with suspenders made of copper hardware, as well as a camera strap for your DSLR with the signature lion head logo stamped into its leather accents. Following the theme of office inspiration, the collection includes a USB drive that is nestled into a fully functioning eraser – now, erasing your memory is not going to be as simple as accidentally blacking out on a Friday night after celebrating the end of another grueling work week. These additions will are available worldwide TODAY on rastaclat.com. Christina is a writer based in Palm Springs, LA, and any place with WiFi. She graduated from UCLA and currently attends USC because she's a traitor and loves being in student debt. She hopes to be the next Carrie Bradshaw with better hair (sorry SJP), and when asked to describe herself in one word, she chooses the word, "indescribable." Don't follow her on Instagram because you'll hate how extra she is and you won't want to be her friend in real life.